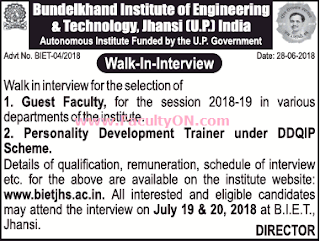 Bundelkhand Institute of Engineering and Technology, Jhansi(U. P) has advertised in the Times of India newspaper for recruitment of Teaching Faculty--Guest Faculty,, Personality Development Trainer jobs vacancies. Interested and eligible job aspirants are requested to attend walk-in on 19 & 20th July 2018.Check out further more details below. Name of the College :Bundelkhand Institute of Engineering and Technology, Jhansi(U. P). About College:Bundelkhand Institute of Engineering & Technology, Jhansi has proved to be the most preferred destination for aspiring technologists across the country. The institute consistently attracts the finest faculty and the best of students for its Bachelor’s and Master’s programmes. B.I.E.T has a rich tradition of pursuing excellence and has continually re-invented itself in terms of academic programmes and research infrastructure. Eligibility refers to the College website. How to Apply: Interested candidates may please view College website for knowing schedule of interview. All elibile candidates will attend walk-in on 19th,20th July 2018 @college campus. 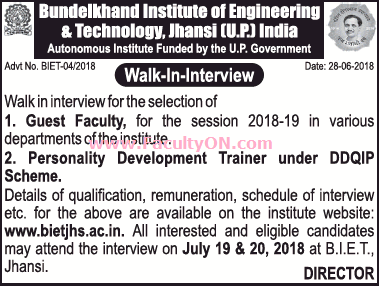 Reference: Recruitment Notification / Career Job Opportunities notice for Teaching Faculty -Guest faculty,Personality Development Trainer on Times of India newspaper Dated 4th July 2018.